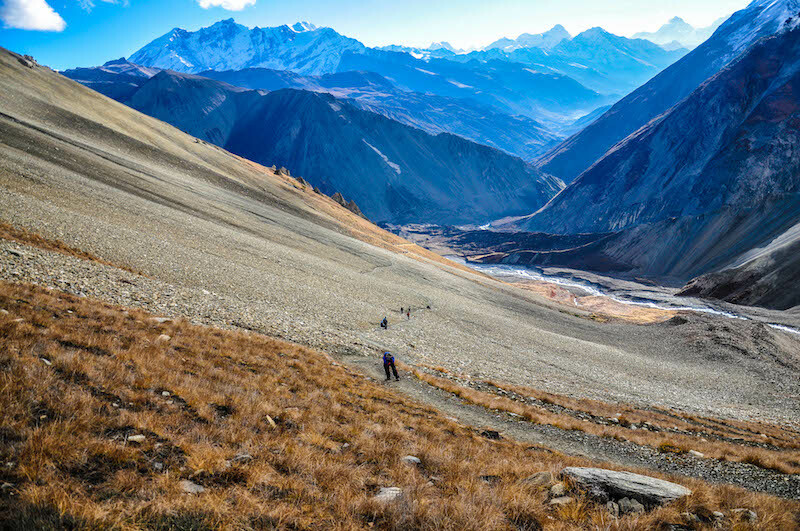 Trekking is not my cup of tea — one of my friends said one day prior to the day I was leaving for Annapurna Circuit trek. I, along with four other friends, planned for trekking during Dashain (National Festival) vacation, rather than luxuriate at home. 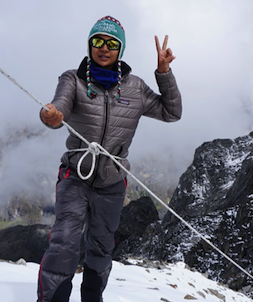 Trek to Annapurna massif takes one along varied landscape, lifestyle and culture and our trek around this was a varied journey too — in terms of physical, psychological and emotional state. Looking at the footsteps and watching over own breathe was the only thing one opted for, mostly at uphills, while other times questioning oneself why people choose to gasp and sweat. But the feasts that your eyes get answer all! 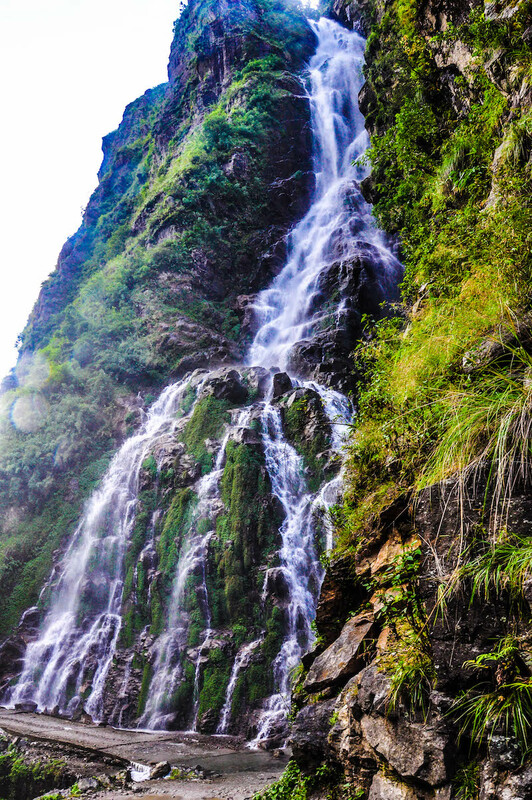 The picturesque trail takes traveler along refreshing waterfalls, incomprehensible landscape, placid villages and innocent faces. After taking 4 wheelers upto Chame, we started the actual trek, saving roughly 4-5 days of the normal trekking days around the circuit. Mountains started to peek afar at Pisang Village, but, it was only on the way to Ice Lake (4600m), trailhead being Braga Village, that they started zooming in. We decided to take the plunge and make it to all the paramount destinations possible even amidst our crunch time. The trail to Ice Lake wasn’t an easy sledding. Locals also said that this would help us guesstimate the perseverance of an individuals to cross the Thorang-la; which was our predominant destination. The view throughout the way was inimitable! 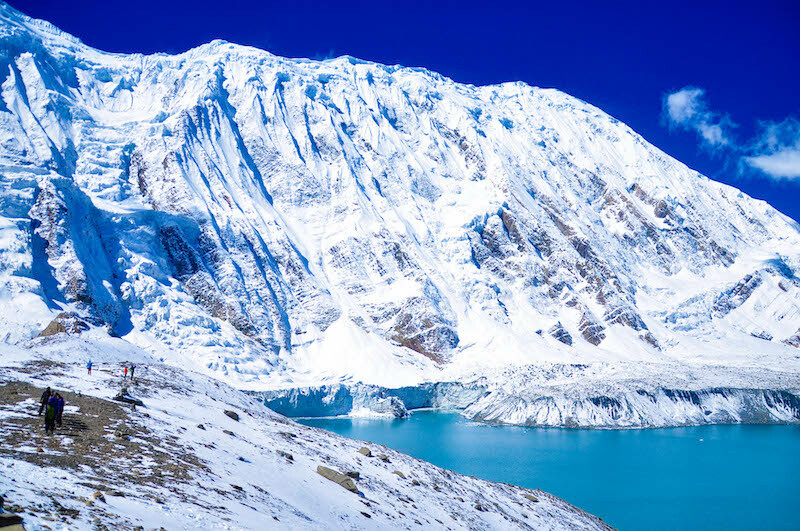 Itoffered a scenic and panoramic view of traditional Braga Village, Manang Village, Gangapurna Mountain-glacier- lake, Tilicho Peak, Annapurna second, Annapurna fourth, Annapurna third, Chulu east as well as Pisang peak. 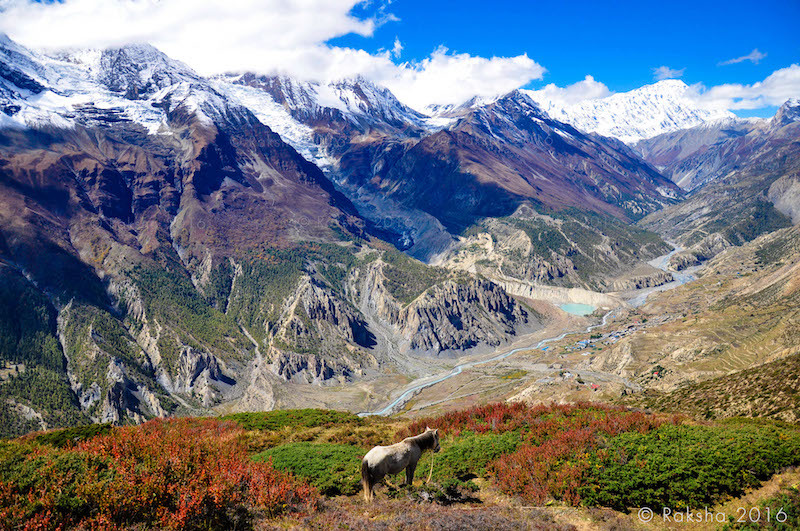 Trekking at this altitude and again nose-diving to ~3500m to Manang on the same day availed us to acclimatize well for the destinations in the days to come, to build confidence, and enjoin our longing of visual feasts. The pathway to Tilicho Base Camp was like a highway to hell. It was thrilling to walk in the narrow landslide trail besides deep gorge .The blue sheep walking above along the hills was another threat during dusk hours (which was not recommended by the locals), as theycould slide down rock pieces. 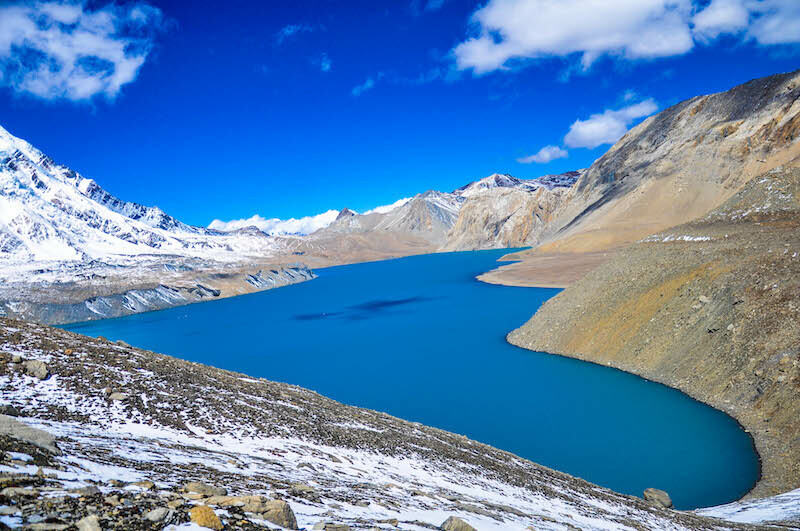 But all the risk and fear could be overlookedupon by the mesmerizing sight of Tilicho Lake resting untouched at ~ 4949 m.
There are several factors pulling you against the gravity of your will when you are struggling to climb up the pass. We loomed towards Thorang-La at around 3:30 am from Phedi. The first one hour climb up to High Camp is almost vertical. The walk in the company of dazzling clustered stars above makes us realize important lessons. The feeling of uncertainty lingers throughout the trek, yet the only choice is to move on. I found it quite synonymous to life. There were horses right at the points where your body felt like giving up, and the local horsemen offering the ride challenged the confidence. Should I take the horse to the steep Pass or should I get going? The ride definitely would have cost more than the money! The value of getting on the top in hustle was higher than the luxury ride. It was a glorious triumph after a tough climb. As it is wisely quoted “The best view comes after the hardest climb”. Not just the view but the feeling of accomplishment that follows seems commendable forever. It is the feeling of conquering your weaknesses and overcoming your doubts, that feeling of “Yes, I did it!”It is quite astounding how a trek can transform you — activating visual sense, the sense of empathy, sense of both pain and joy, being close to nature and with yourselves! There were tea houses along the trail, where locals have to carry water for hours for daily usages. Commodities also get airdropped at Tilicho Base Camp because of the difficult terrain. As a traveler, I realized how one could contribute directly or indirectly to such rural communities, as well as towards the entire countries revenue, through tourism. Because, travelers generated employment and business opportunities. There’s no explicit reward for travelling, but, we definitely bring back memories for lifetime by this.